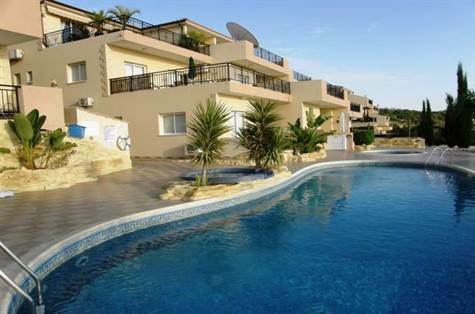 Cyprus Property Blog by Cleo : Mesa Chorio Apartment for sale - Just listed - Walk to ISOP! Great, modern apartment and complex! The development itself is well maintained and has a very nice communal swimming pool with a jacuzzi and a separate children's pool all overlooking the wonderful sea views. There are plenty of sunbeds and the area is nicely landscaped with palm trees and other tropical plants and bushes.